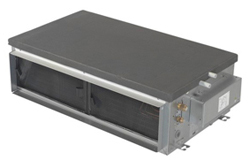 Daikin offer a complete range of Horizontal ducted air conditioning systems from 3.50kw to 14.00kw, matched to their Classic, Comfort and Seasonal Inverter condensing units. The FBQ range can overcome resistances from 30Pa to 90Pa on Medium fan speed and 120Pa on High fan speed on selected models. 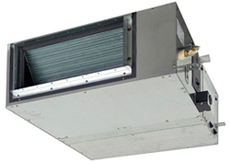 The Siesta ABQ ducted fan coil units can overcome a Static Resistance of up to 147Pa on High fan speed. 1ph & 3ph Power supply options.